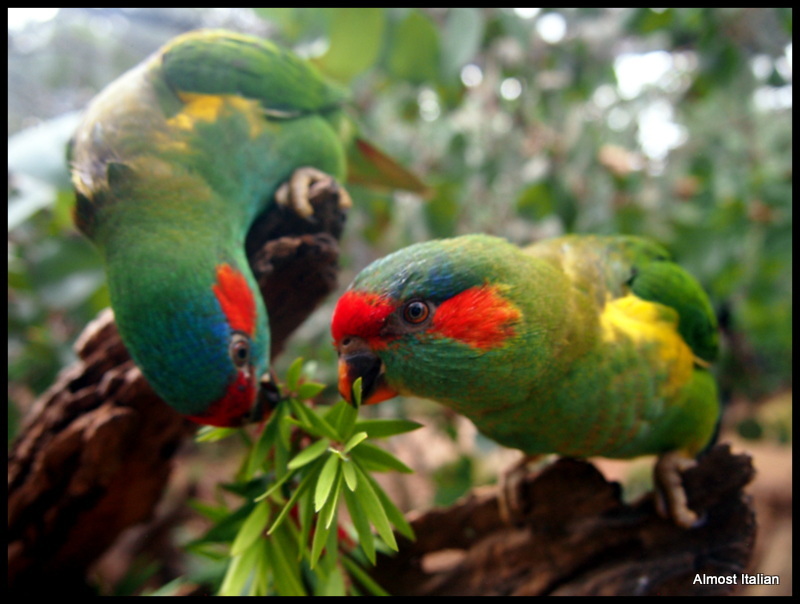 Healesville Sanctuary is a not-for-profit conservation organisation in the countryside of Victoria, Australia. 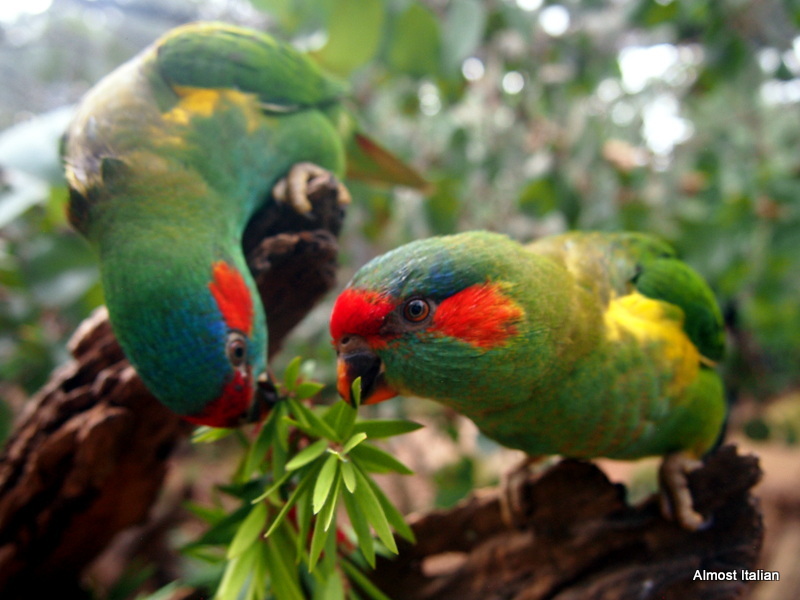 It is dedicated to fighting Australian wildlife extinction. The programme includes breeding endangered species then returning them to the Australian bush, and rehabilitating injured wildlife. Visitors from Australia and overseas enjoy a day at this extraordinary zoo. Recently we took Alberto, from Pavia Italy, to the Healesville Sanctuary after watching the film Healing. We mainly went to see the Birds of Prey show, hoping to have a close encounter with a Wedge Tailed Eagle, ruler of the sky. 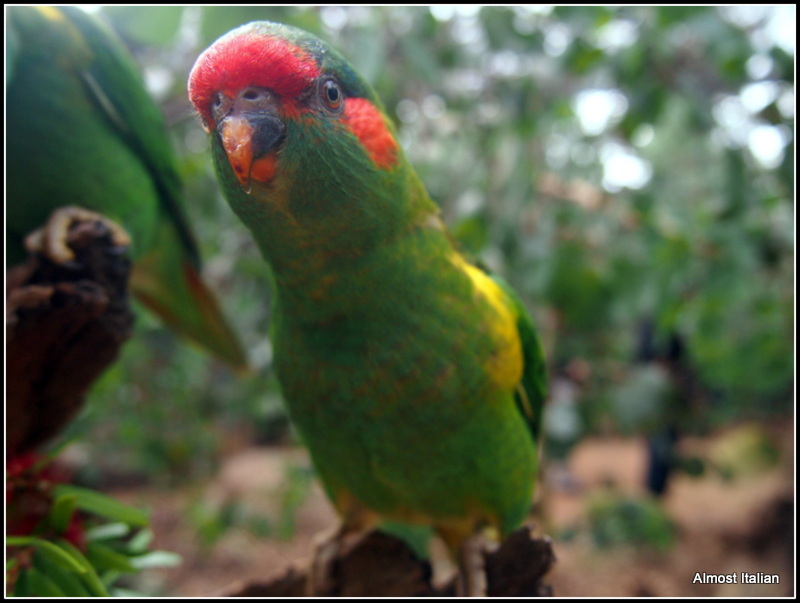 Along the way we enjoyed visiting these vividly coloured Lorikeets and Rosellas. This week the Daily Post goes colourful as it looks at the word Vivid, as Sydney celebrates its 7th Vivid Festival. For the best virtual tour of Sydney’s Vivid light show, visit Fig Jam and Lime Cordial’s post here. 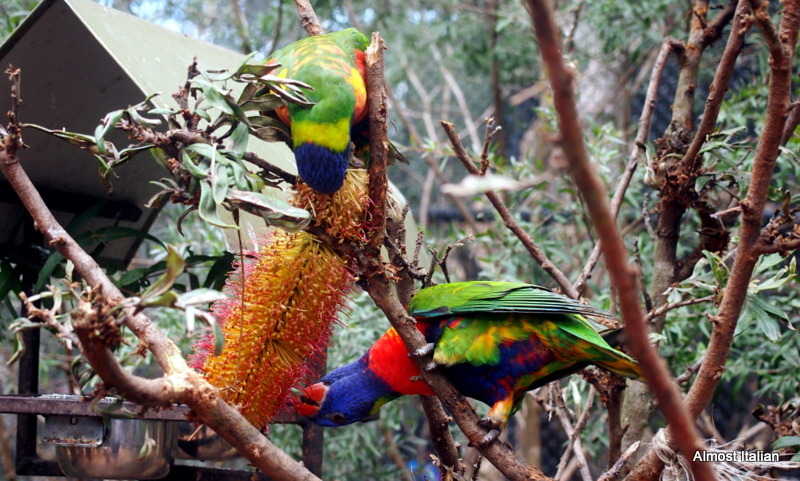 We used to take all of our overseas guests to Healesville Sanctuary. Beautiful photos here Mrs I. Our first time to Vivid this year, it was pretty spectacular. I would love to visit Vivid in Sydney- might put it on next years’s calendar. Yes, Healesville is teh place to take the OS folk. Followed by a lunch in the Yarra Valley!!!!! When living in Kinglake, Healesville used to be something that was done with ease. Now its over 20 years. Good memories! Thanks for the reminder; I think I have a vivid shot taken at your place that may qualify. I think you might!!! Don’ need to go to the Sanctuary for vivid birds. So kind of you to link back, thank you! I think we have some of the most colourful birds in the world here! And did you see the wedge tail? Yes, Jess the Wedgy is always there at the ‘Spirits of the Sky’ show but this time she played up and didn’t do her usual swoops and dives. Your post on Sydney’s vivid was amazing. Must get there one year! Healesville is on my list to visit this year and seeing these photos only makes it more so a must. Mr Woolly , you will love it. Great photos! I also used a photo of a bird for this challenge! I’m thinking I will have to add Healesville Sanctuary to our list too! What an adventure Alberto must have had! How did he get to Padua, and why did he have to come back? There’s an entire blog post in that question methinks! Alberto lives on a rice farm neat Padua, where they grow arborio rice. Alberto came here in 2012 as a Wwoofer and stayed with us for a month, then we caught up again (and again) before he returned home. He arrived again just after Christmas and stayed for a month, then went travelling, (including a month around Alice Springs) then returned ‘home’ here before heading back. Alberto is my adopted nephew. He is now part of the family. Gorgeous vivid feathered friends. Healesville Sanctuary is always on our list for visitors from OS too, they all love it, up from and personal with the Aussie fauna. They do love it- a quick drive over the hill for us. Grrr, that should read up “front” and personal! Great shot! I love Healesville. You once lived so close- It is a great spot to take the OS folk. Yes, we could meet at the Yarra at Warrandyte for a picnic. You bring that beetroot tart and a bottle of Toi Toi and I’ll bring …. the rug and glasses. So pleased it went well. The stock is a good all rounder. Great shots. Such beautiful plumage! plumage – love that word Helen. We used to have birds like this visit our windowsill when we lived in Mosman. They’re so colourful and pretty! Absolutely gorgeous photos, Francesca, lovely. Thanks so much for sharing! We have a few of those birds visiting our verandah too- though not lately. We do indeed Lyn. Most visitors use the word ‘exotic’ for our every day birds.